The View From Here and the award winning online literary zine The Hiss Quarterly (THQ) have merged. Sydney Nash, the Production Editor of THQ, joins us as Managing Editor to take the crew to ten here at the magazine and to fling open the doors to submissions. 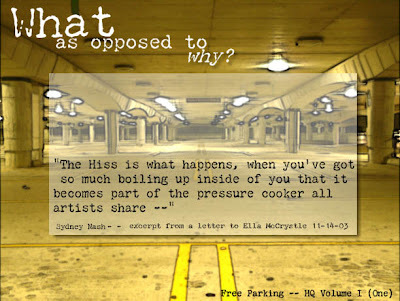 ...back in the day when Literary eZines and the world of online publishing wasn't nearly as prolific or pugnacious; two profound people put together a marvelous plan (we'll stop with the "p" words now) that eventually became The Hiss Quarterly. Ella McCrystle and Sydney Nash weren't quite sure what would become of their idea. Ms. McCrystle had several acquaintances of some writing fame in her address book, Sydney was a digital diva of some merit. Bored, slightly tipsy, tending towards insanity and spending hours on the phone gossiping led to the creation of THQ. "Something Hissy -- something like the Natl. Enquirer of online 'zines, something that people truly looked forward to reading -- but they might not admit it to their friends. Something a little fey, but not outlandishly weird. Literary, but not over the top. Something a little Kerouac, but not whack." What will change now the TVFH and THQ have merged? The mains changes are that The Front View of THQ comes across to the new magazine, so we now accept submissions, extracts of which will appear here on the magazine's main page and in full on the new reformatted page of The Front View (see tabs above.) We obviously get the talented and wonderful, Sydney Nash, who will head up the new fiction side of the magazine. Cheers Sydney! And the poetry side (The Rear View) of THQ will stop, to be resurrected at a later time as a separate project. The new magazine will still be called The View From Here, and it will be still found at this site address. I'll still be at the helm so you can blame me whenever we hit a few rocks - and we will still be in print monthly and hopefully - no definitely - we will be bringing you some of the fresh new talent out there in the wonderful and scary world of writing. Congratulation Mike and All the gang of both wonderful entities.. Thanks AC - great things ahead! We're on ... and bustin' out all over the place.